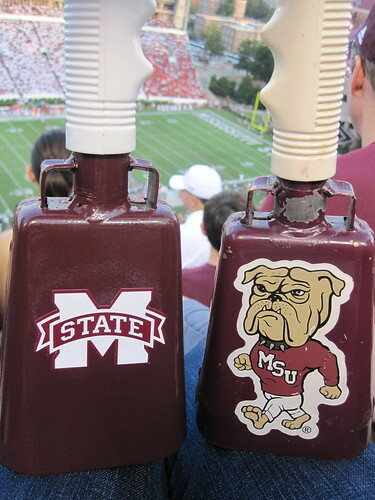 Bryant's & Whitton's MSU cowbells! A few weeks ago, Mr. Fancy Pants and I made the trek to Mississippi to see the Mississippi State Bulldogs play the University of Georgia Bulldogs. 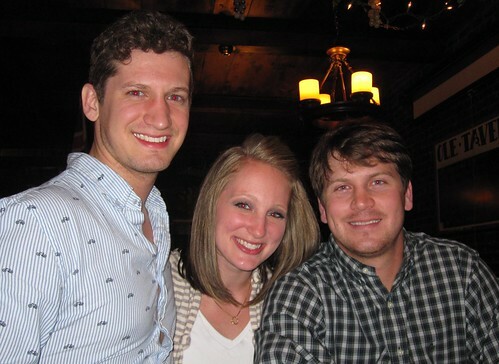 We got to see many old friends and had a great time! 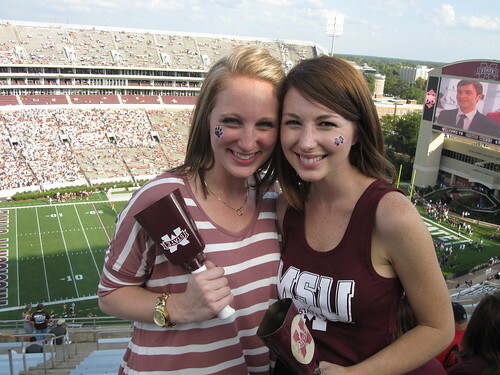 MSU pulled out a BIG win which only made the weekend better. William and I got our first “family” cowbell that is now proudly displayed on our living room shelves at home. 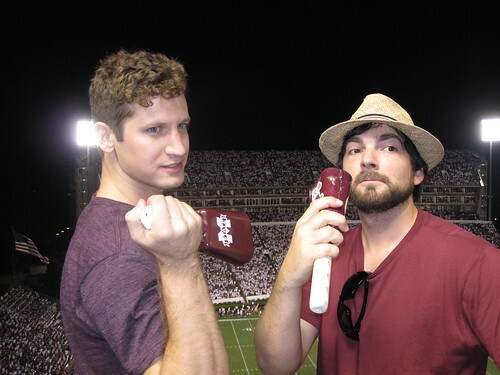 I will admit I had a great time shaking that cowbell during the game. 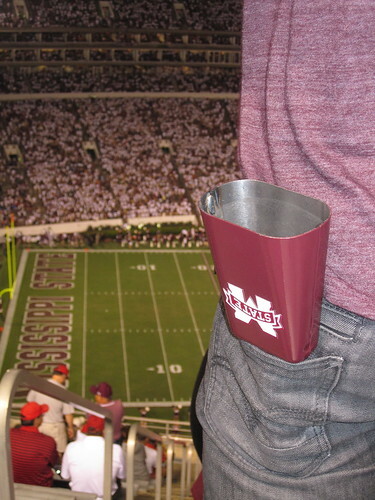 Every game I’ve been to in Starkville I have been cowbell-less and they annoyed the stuff out of me. BUT now that I have my own, it’s much better! The girls from Georgia that sat right behind us didn’t exactly feel the same way. There is a little cowbell icon that shows up on the screen in the stadium when it is an “approved cowbell ringing” time. We pretty much ignored that though. Ha! The boys and the Georgia fans had some less than positive words before the game was over…didn’t stop us though! Bringing in the game ball! I am not sure why but this picture makes me laugh. Here is William and his cowbell. The boys and their bells. Sometimes I think that William would rather be still living Landon than me! 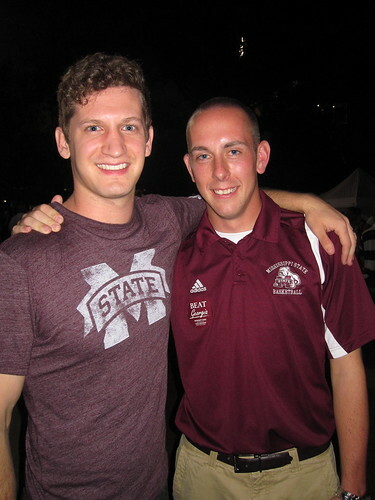 William and his other favorite roommate from college, Drew! The Bryants and Whittons say GO STATE! We also got to see William's best friend from childhood Ryan! All in all, it was a great weekend. We got to see SO many people that we love dearly and miss very much. It made it all the better that MSU won their football game! To all our Mississippi friends, we love and miss you! Thanks for a great weekend! Oh man do I love football season. We’ve been doing a lot of football watching around the Bryant house so I thought I’d share some of it with you. The above picture is of Bryant Denny Stadium in Tuscaloosa, AL home of The University of Alabama Crimson Tide (where I went to college). This stadium is probably in my top 5 favorite places I’ve ever been. Call it lame, call it cool, call it whatever you want…I LOVE Alabama Football! Our stadium was just expanded again and now holds a staggering 101,821 people making it the fifth largest stadium in the nation. Let me tell you one thing–it is LOUD in there. Here is another place that I love. 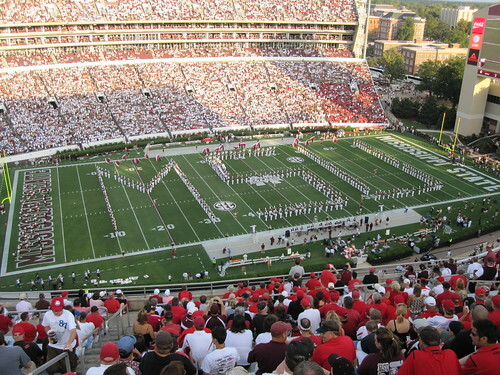 This is Davis-Wade Stadium in Starkville, MS home of the Mississippi State Bulldogs (where Mr. Fancy Pants went to college). Both State and Alabama are SEC schools so we have some friendly rivalry going on in our house from time to time. Avey has become a really big football fan and demanded new game day gear for this football season. So we bought him new collars and jerseys for both Alabama and Mississippi State. I’d venture to say he’s the one that’s fancy now! Avey's Game Day collars. Yes they're engraved with his deets on the back. Just in case he gets too excited about a game and runs out the front door. Avey dons his gear during each game which ultimately means he changes clothes a lot on Saturdays. It’s ok though because he’s a true fan. 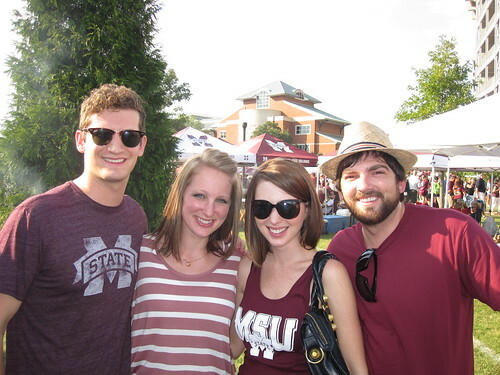 The Fancy Pants family in our MSU gear during the MSU/LSU game. MSU ALMOST had a win that game! 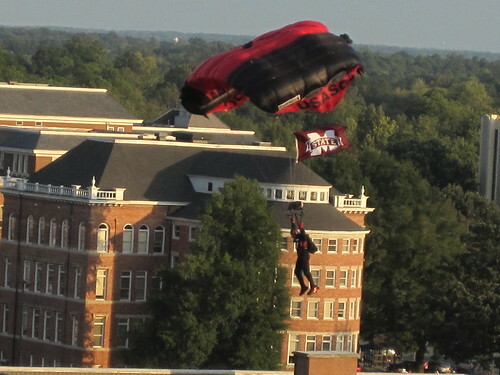 These pictures were yesterday during the Alabama/Florida game. Avey may look upset in these pictures and you may think, “Hum, it’s probably because you put a DOG’S football jersey on a cat.” I encourage you NOT to jump to that conclusion my friends. He was just really into the game and was not in a picture taking mood. But we had to capture the moment so he got over it. Here are Avey and I during the 4th quarter when I decided to take pictures. Mr. Fancy Pants and Avey were not amused with my timing. In my defense, it was during a time out. Man oh man do we love some football here! 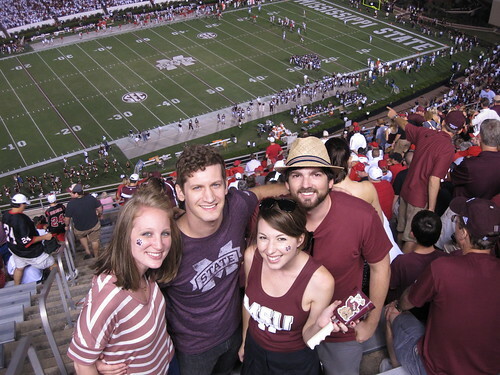 A few weeks ago we flew to Mississippi to see all of William’s college buddies and went to an MSU game. I’ll post about that soon! 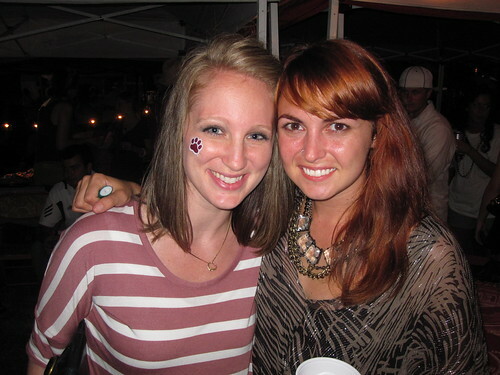 In the meantime… ROLL TIDE ROLL and GO DAWGS!